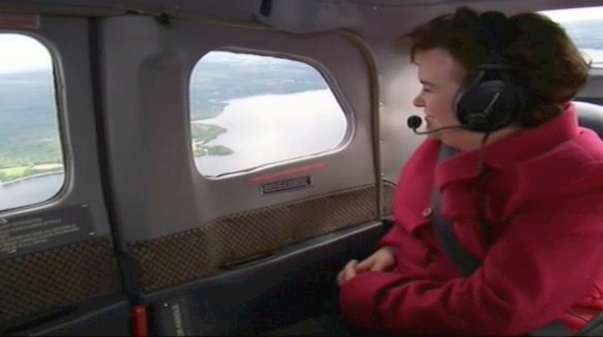 Loch Lomond Seaplanes, Europe's Premier Seaplane Airline, was recently featured in the ITV documentary on Susan Boyle's life. The programme, "I Dreamed A Dream - Susan Boyle", was aired in a great many countries Worldwide, including North America, on Sunday 13th December. For the Loch Lomond Seaplanes' team it was a very special day ! It was a great pleasure and a delight to meet Susan and organise the seaplane flight for her return to Scotland - before her splash down on Loch Lomond and disembarkation at the De Vere Cameron House Hotel pontoon Susan thoroughly enjoyed a scenic tour of the stunning Scottish landscape that makes up the Loch Lomond and Trossachs National Park. Susan said on her official website, "that was brilliant - fantastic - one of the best experiences of my life!" - Living The Dream! View "I Dreamed a DREAM - SUSAN BOYLE"